The site for humanity’s first-ever attempt to land a spacecraft on a comet has been chosen. Philae, the tiny lander being carried by the Rosetta probe, will attempt on Nov. 12 to anchor itself to an area on the smaller of comet 67P/Churyumov-Gerasimenko. The location is known as Site J. 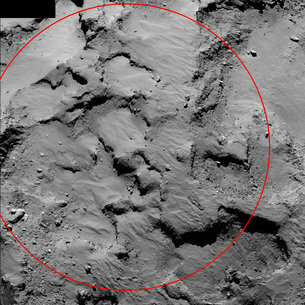 This image, obtained by Rosetta from 30 kilometers away, shows Site J. Courtesy European Space Agency. “Now that we know where we are definitely aiming for, we are an important step closer to carrying out this exciting – but high-risk – operation,” Fred Jansen, ESA’s Rosetta mission manager, said in a statement released Oct. 15. Rosetta itself is now about 10 kilometers away from the comet. It will launch Philae, if all goes according to plan, when it is about 22.5 kilometers from the comet’s center. Philae’s journey to the comet will take about seven hours. Communication confirming a successful landing on the comet can be expected to arrive at Earth during the early- to mid-morning hours in North America. Rosetta’s mission team will confirm that the probe is on the correct trajectory and that Philae is ready to receive computer commands before the final authorization to send the tiny lander to comet 67P/Churyumov-Gerasimenko is transmitted. Philae will not be idle during its movement from Rosetta to the comet. It will study the comet’s dust, gas, and plasma while moving slowly through the short distance in space. 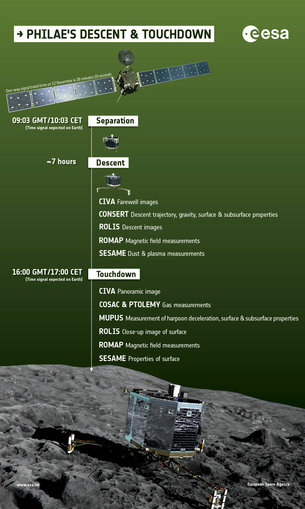 This graphic details the steps in Philae’s process of moving from the Rosetta probe to a landing on comet 67P/Churyumov-Gerasimenko. Courtesy European Space Agency. Mission planners are not sure how much time Philae will have, once anchored on the comet, to study its nucleus and other features. The lander has a solar-powered battery, which will provide more or less energy depending on the degree to which the solar power receiver is covered by dust from the comet. ESA said in a press release that Philae is not expected to be able to conduct scientific observations of the comet past March 2015. 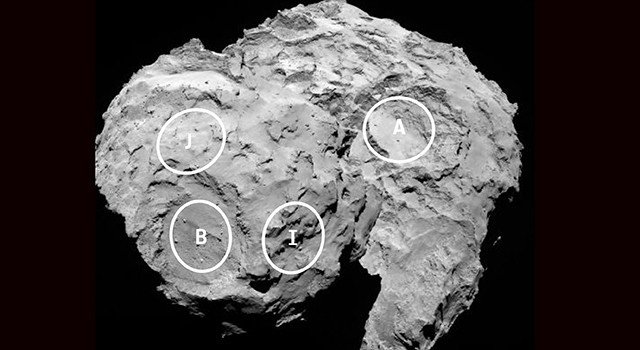 This annotated image shows four of the five possible landing sites on comet 67P/Churyumov-Gerasimenko for the Philae lander. Image courtesy European Space Agency. Researchers have chosen five possible landing sites for a spacecraft that will attempt in November to become the first ever to land on a comet. The European Space Agency will consider several factors in making the final choice of a landing site on comet 67P/Churyumov-Gerasimenko for the Philae lander, including whether it has obstacles to landing and whether the amount of solar energy appropriate for the lander’s power array is available. One of the most basic factors that will influence the choice of a landing site is whether it is one to which the lander can be accurately guided. That challenge is magnified somewhat by the unusual shape of comet C-G, which has been likened to a rubber duck. Another problem for mission planners is whether a potential site impedes Philae’s ability to anchor itself to the surface and remain upright. Rocky sites pose hazards to the spacecraft, but there’s no guarantee that a smooth site would be one to which the lander could be easily guided. Yet another consideration will be the degree of solar illumination that predictably hits the landing site. Philae depends on batteries rechargeable by sunlight for its power. Because the movement of the comet will prevent Philae’s batteries from being constantly re-charged, it will be important for the landing site to be fully illuminated when that area of the comet faces the sun. “If it lands somewhere where it’s shadowed, once the batteries are dead it won’t get any more power,” Scheeres said. ESA faces a mid-September deadline to choose Philae’s destination on the comet. It will continue to gather information about the five potential landing sites for several more weeks. “The process of selecting a landing site is extremely complex and dynamic; as we get closer to the comet, we will see more and more details, which will influence the final decision on where and when we can land,” Fred Jansen, the Noordwijk, The Netherlands-based Rosetta mission manager, said. Three of the possibilities are located on the comet’s smaller lobe, while two are on the larger lobe. Each of the sites must accommodate the one square meter-sized Philae lander, which will examine the chemical and physical structure of the comet and obtain close-up images of the comet’s nucleus. Actual landing of Philae will occur when Rosetta and comet C-G are about 450 million kilometers from the sun. Researchers want to make the attempt before the comet gets too close to the sun. Too much solar energy would make landing, and operation of the lander once on the surface of the comet, more difficult. Rosetta is currently in orbit around the comet. It will continue efforts to study the comet through 2015, following it through an orbit around the sun. 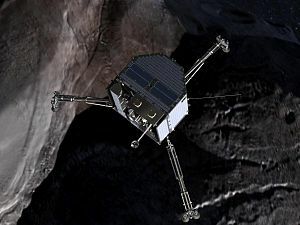 This frame from the film “Chasing a Comet – The Rosetta Mission” shows an artist’s conception of the Philae lander approaching comet 67P/Churyumov-Gerasimenko.